We love this soup! It has an authentic mexican taste - it's flavorful and just a little spicy. 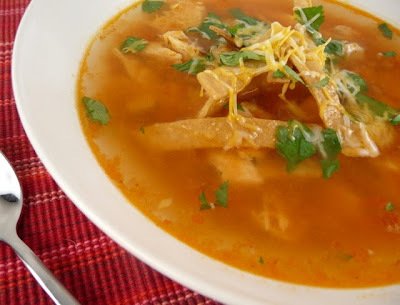 It's a really great soup if you or someone you love is not feeling well - it will definitely make them feel better :) The homemade tortilla strips are fantastic and so easy to make. The soup recipe seems complicated - but it's really not - I've made this many times on a weeknight. Enjoy! 2. Spread tortilla strips on rimmed baking sheet; drizzle with oil and toss until evenly coated. Bake until strips are deep golden brown and crisped, about 15-20 minutes, rotating pan and shaking strips (to redistribute) halfway through baking time. 3. Season strips lightly with salt; transfer to plate lined with several layers paper towels. 1. In a large pot, bring chicken breasts, broth, 2 onion quarters, 2 garlic cloves, cilantro, oregano and 1/2 teaspoon salt to boil over medium-high heat. 2. Reduce heat to low, cover, and simmer until chicken is just cooked through, about 20 minutes. Using tongs, transfer chicken to large plate and allow to cool. Once cool, shred chicken into bite sized pices. Leave the broth in the pot with solids; set aside. 3. Place the tomatoes, 2 remaining onion quarters, 2 garlic cloves, jalapeño, chile and adobo in food processor until smooth. 4. Heat oil in Dutch oven over medium-high heat until shimmering; add tomato/onion puree and cook, stirring frequently, until mixture has darkened in color, about 10 minutes. 5. Place a large mesh strainer over the Dutch oven and carefully strain the chicken broth into the tomato mixture. Discard any solids caught in the mesh strainer. 6. Bring the soup to boil, then reduce heat to low and simmer to blend flavors, about 15 minutes. 7. Add the shredded chicken and simmer until heated through, about 5 minutes. 8. To serve, place portions of tortilla strips in bottom of individual bowls and ladle soup into bowls; pass garnishes separately. This looks like a tasty recipe. I especially like the garnishes. I think this will be on my meal list for next week.